Mamma mia! Talk about tasting like homemade! Multi-grain pasta with perfectly seasoned mouthwatering meatballs smothered in a zesty tomato sauce, topped with Romano and mozzarella cheese. Ingredients: COOKED ENRICHED WHOLE GRAIN SPAGHETTI (WATER, WHOLE DURUM WHEAT FLOUR, SEMOLINA, NIACIN, FERROUS SULFATE, THIAMIN MONONITRATE, RIBOFLAVIN, FOLIC ACID), PRECOOKED MEATBALLS (BEEF, PORK, WATER, ROMANO CHEESE [MILK, CULTURES, SALT, ENZYMES], TEXTURED SOY PROTEIN, RICOTTA CHEESE [WHEY, MILK, CREAM, VINEGAR, XANTHAN, LOCUST BEAN AND GUAR GUMS], LIQUID EGG WHITES, BREAD CRUMBS, SALT, DRIED GARLIC, SPICE, DRIED PARSLEY, BROWN SUGAR, NATURAL FLAVOR, SOY LECITHIN), TOMATOES (TOMATOES, TOMATO JUICE, CITRIC ACID), WATER, TOMATO PASTE, MOZZARELLA CHEESE (PART-SKIM MILK, CHEESE CULTURES, SALT, ENZYMES), ONION, BURGUNDY COOKING WINE (WINE, SALT), SPICES, GARLIC (GARLIC, WATER), MODIFIED FOOD STARCH, SUGAR, WHEY PROTEIN CONCENTRATE, SALT, VEGETABLE BASE (SAUTEED VEGETABLES [CARROT, CELERY, ONION], SOYBEAN OIL, SALT, MALTODEXTRIN, CORN STARCH, NATURAL FLAVOR), RESISTANT MALTODEXTRIN. 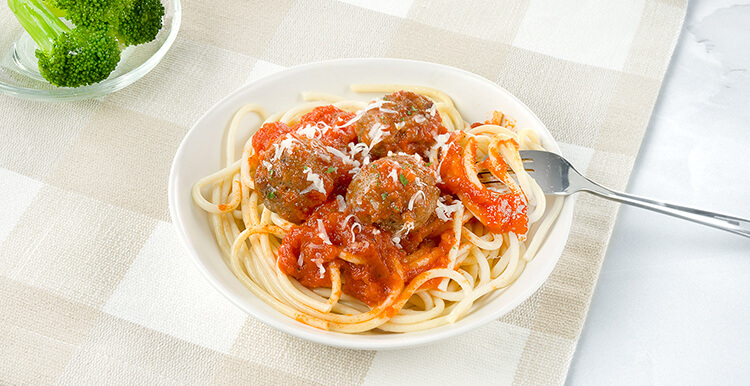 Nutrients: COOKED ENRICHED WHOLE GRAIN SPAGHETTI (WATER, WHOLE DURUM WHEAT FLOUR, SEMOLINA, NIACIN, FERROUS SULFATE, THIAMIN MONONITRATE, RIBOFLAVIN, FOLIC ACID), PRECOOKED MEATBALLS (BEEF, PORK, WATER, ROMANO CHEESE [MILK, CULTURES, SALT, ENZYMES], TEXTURED SOY PROTEIN, RICOTTA CHEESE [WHEY, MILK, CREAM, VINEGAR, XANTHAN, LOCUST BEAN AND GUAR GUMS], LIQUID EGG WHITES, BREAD CRUMBS, SALT, DRIED GARLIC, SPICE, DRIED PARSLEY, BROWN SUGAR, NATURAL FLAVOR, SOY LECITHIN), TOMATOES (TOMATOES, TOMATO JUICE, CITRIC ACID), WATER, TOMATO PASTE, MOZZARELLA CHEESE (PART-SKIM MILK, CHEESE CULTURES, SALT, ENZYMES), ONION, BURGUNDY COOKING WINE (WINE, SALT), SPICES, GARLIC (GARLIC, WATER), MODIFIED FOOD STARCH, SUGAR, WHEY PROTEIN CONCENTRATE, SALT, VEGETABLE BASE (SAUTEED VEGETABLES [CARROT, CELERY, ONION], SOYBEAN OIL, SALT, MALTODEXTRIN, CORN STARCH, NATURAL FLAVOR), RESISTANT MALTODEXTRIN.